We turned the Japanese into English so you can construct an ASIMO with the best of 'em. Have you ever wanted to build your own robot, but didn’t really want to bother with all that engineering degree nonsense? We can’t all be experts at advanced electronics, so Honda came up with a printable ASIMO toy to make us feel like real-live robotics specialists. Right now, there are full instructions on assembling your own 8-inch ASIMO figure on the Honda site, but unfortunately, these are in Japanese. Because we love you, The News Wheel has translated the Japanese instructions into English. Why don’t you ever visit? Pick your ASIMO color. The links will open the printable PDF file. 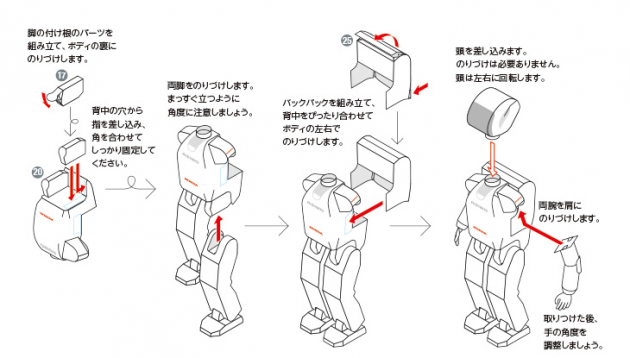 Print your ASIMO from the downloaded PDF file. There should be three pages of parts. We’ve translated the adorable Japanese characters into horrendous, yet readable, English. To those who are not well-versed in the origami arts, a ‘mountain fold’ points up from the paper like a tent, while a ‘valley fold’ concaves inward. Cutting: Cut out all of the ASIMO parts. I suggest an x-acto knife as your weapon of choice. If you don’t have a cutting pad to put under it, a clean plastic cutting board will do in a pinch. Labeling: As you cut out each part, Honda suggests that you use a pencil to lightly write the number of the part (as indicated by the dark circled number on the sheet) on the back of each part. Folding: To make sure that ASIMO is put together well, we will need crisp edges on our folds. Line the ruler up with the edge of a fold and use the tip of the pen to create a sharp crease. Rounding: For rounded parts, gently curl the paper around the barrel of the pen. Gluing: A simple Elmer’s school glue can be used to hold your ASIMO together. Use a toothpick to apply the glue. This will prevent your fingers from getting sticky, and will ensure an even application. There are step-by-step instructions on the Honda Japan site, but these, too, are in Japanese. Again, The News Wheel is your BFF, so we translated. All that Sailor Moon is suddenly coming in handy (you hear that, mom!?). Here are the essentials that you’ll need to know to follow these instructions. The first box of instructions details how to make the head (Part #1) and neck (Part #2). Incidentally, we found the first step to be the most difficult. Your first task is to master the most difficult part of ASIMO assembly. Good luck! Here, Honda tells us to first put the ‘ears’ together by gluing the tabs. This will form the sides of ASIMO’s head. Curl the neck around a pen and glue. This is a challenge, because you’ll be gluing the tabs as you curl, making a toothpick applicator already indispensable. Position the neck vertically in the hole on Part #1 and slip through. Glue tabs to the inside of the head. Fold the sides of the head down. Remember, you should have made crisp folds on all of these tabs. Wrap ASIMO’s face over the sides of the head, gluing each tab as you go. 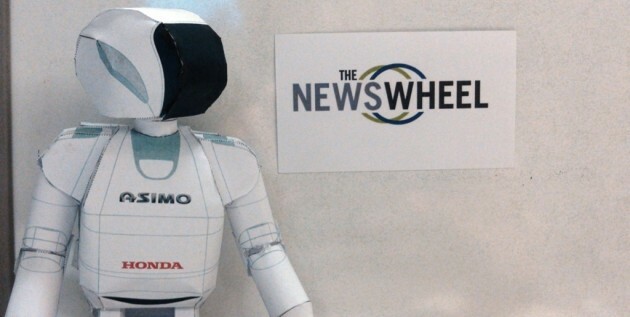 ASIMO may not look like he works out, but he’s got a finely-tuned body. Create the body with soft curves and a few rigid edges. Use a pencil to round out the upper bib of Part #3, then glue to the upper edges of the body. Apply glue dots and pinch together the asterisked portions on the bottom corners of the bib. Roll the neck (Part #4) on a pen to curve. Tap glue on the tabs of the neck attachment piece, then insert it into the neck hole. Fold the back of the bib down and glue into place. Fold the bottom of the torso and glue. ASIMO loves warm hugs, so let’s give him some decent biceps to work with. Mount the shoulder, and watch that elbow tab. Gently curve the long portions of Parts #5 and #11, then glue as shown. Attach them to their respective sides of ASIMO’s torso. Remember; a green star means ASIMO’s right side, and pink is his left. Round out the arm pieces (Parts #13 and #7) with the tube of a pen. Attach the wrist (#15 and #9) using just a bit of glue on each of the small arm tabs. Bend the arm and glue the tabs together that will give ASIMO’s elbow some definition. This part was one of the most difficult to complete. Use two toothpicks to hold these tabs together until partially dry. Round the hands with a pen (Parts #10 and #16), as well as the elbow covers (Parts #8 and #14) Adhere the hands and elbow covers to the arm. Cap the arms with #6 and #12. These will make a flat surface that can be glues to ASIMO’s shoulder. The feet and legs are pretty easy to assemble. ASIMO puts his legs together one at a time, just like any other robot. Assemble each leg (Part #21 and #18) with crisp edges folded along the sides. Fold up the back of the legs and gently curve the two tallest top points with a pen. Glue in place. Fold the remaining point down to cap the leg and glue into place. Fold together parts #22 and #19 to make the ankles, and then create feet by carefully gluing all of the little tabs on parts #23 and #24. Once dry, glue the foot to the bottom of each leg, keeping our green/pink color coding in mind. Some pressure for a few minutes is required to get the foot to adhere. Put together all of ASIMO’s parts, but don’t glue the neck. By now, your mastery of ASIMO manipulation should make this easy. Fold up your leg connectors; parts #17 and #20. Glue them into place, making sure the circular tab faces front. Let dry. Glue each leg to the connectors, keeping in mind that green is ASIMO’s right side, and pink is his left.Round out and assemble ASIMO’s backpack, then attach at his sides. Add glue to the flat cap on ASIMO’s arm and attach at the shoulder. Add his head by inserting the top neckpiece into the bottom. There should be enough tension that you do not need to glue the neck; if you leave it unglued, then ASIMO can turn his head! There you have it. You built a freakin’ robot. All it took was hours of translation on our part, and probably a few printings and some intense frustration on your side of things. Mine only took 4 hours to cut and complete! Keen! Now, go clean the glue out of your fingernails and try to feel good about the time you just spent making an all-too-crushable paper robot. For extra fun, give ASIMO a raging neck tattoo, or at least draw on a few bumper stickers. 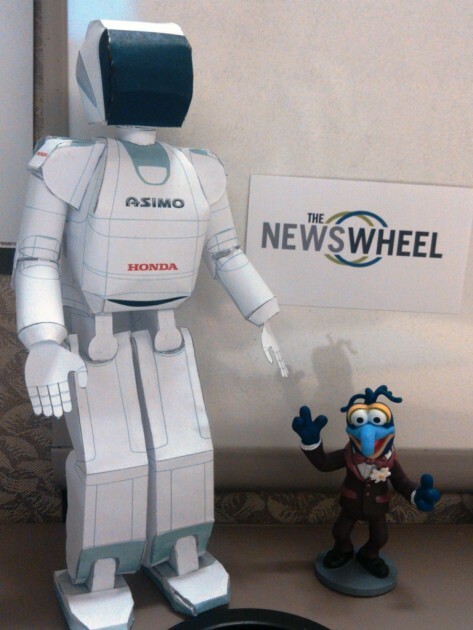 Please share your photos of your paper craft ASIMO on our Facebook page, and subscribe to our weekly newsletter for more automotive papercraft. We’d love to see what you came up with (even if it is an angrily balled-up wad of paper).